When Lucy visits Anna Zinnia’s garden, she is enchanted by all she sees; beautiful flowers and busy insects. When Anna Zinnia reveals a box of seeds, she tells Lucy, ‘In each seed lies a hidden, baby flower.’ Lucy plants the seeds and then waits and waits for the young plants to appear. 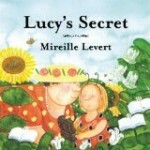 Lucy’s Secret is richly illustrated and simply told. It will be a lovely accompaniment for your springtime seed planting and gardening activities. You may also be interested in our free, printable, Planting a Flower Garden sequencing activity.